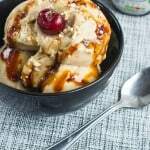 Banana ice cream recipe – banana ice cream that’s no churn, using just one ingredient so quick and easy to make in less than 5 minutes. I’ve been saving this raw banana ice cream recipe until the weather improved or at least until the sunshine decided to exudes its rays. 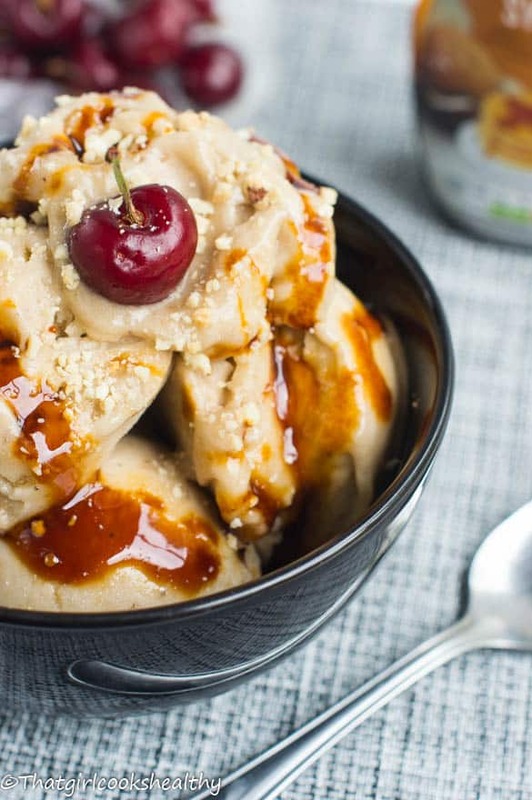 I first made this vegan style frozen banana ice cream I knew I was onto something big. This ice cream is probably one of the most simplest you’ll ever make and yet the taste is completely foolproof to boot. 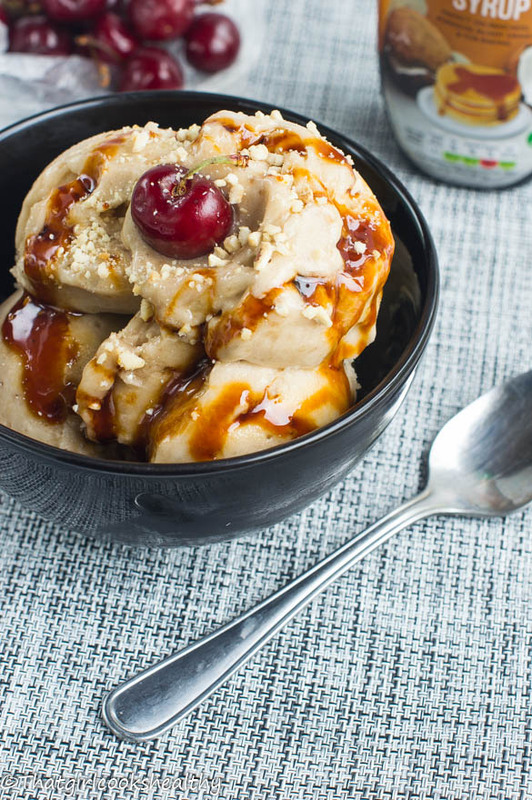 Let’s discuss what you’re here for the ice-cream, a true favourite dessert of mine and probably yours too. Being dairy free isn’t easy when it comes to things like milkshakes, chocolate and ice-cream, believe me it can present as a challenge. I’m so glad I took the initiative to conduct my own research into alternative ways to make some the aforementioned because as dramatic as it may sound, life just wouldn’t the same without enjoying an alternative to those dairy laden treats. I’m a huge fan of ice-cream, Ben and Jerrys cookie dough ice cream was my thing back in the day. We would have movie Fridays with popcorn, ice cream and soft drinks, although we weren’t encourage to eat lots of sugar. Friday nights was a means of having some social downtime after studying endlessly throughout the week. I always said to myself when I begun blogging I’d make a variety of dairy free ice creams with this one being the first. 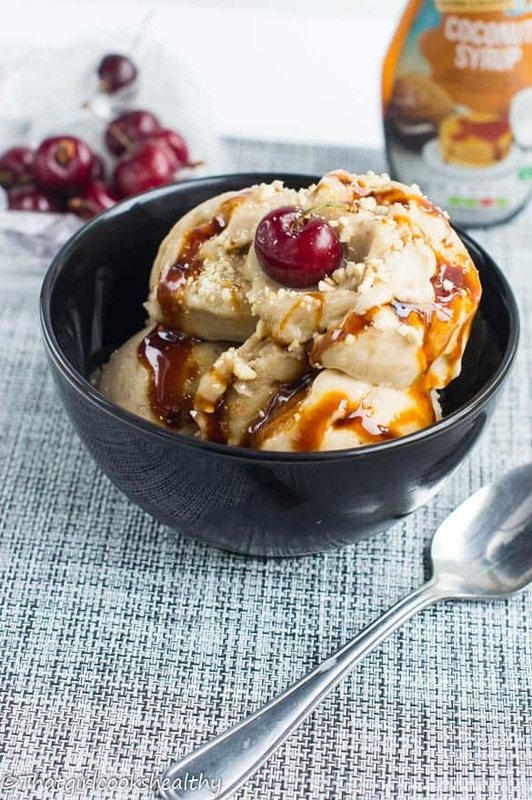 Banana ice cream is incredibly easy to make, it’s suitable for any dietary need and it’s so filling. What’ you’ll need to do is stock up on a load of bananas. In my house I have bananas on rotation to the point where it resembles a plantation, seriously that gives you an idea of the quantity. Use plenty of bananas – In order to replicate the results in my pictures you’ll need about 6 large bananas. You can use as little or as many as you like, but do try to procure some dark bananas as they are the sweetest. Freeze your bananas – Proceed to slice and freeze the bananas in a zip lock bag, they may turn dark but that won’t have any impact on the taste. 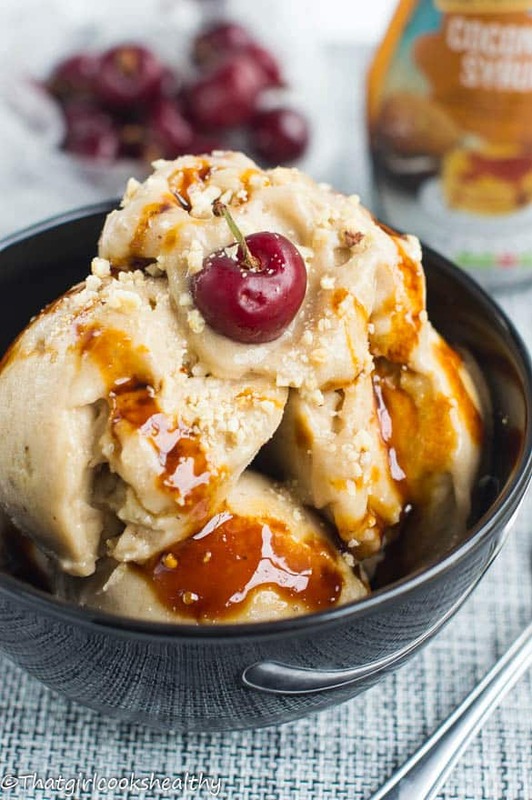 Food processor is needed – You’ll need a good sturdy food processor to create the banana whip which converts to ice cream. Add the banana pieces slowly – A little at a time, whipping by segments until the batch in the zip lock bag is in the food processor. Fit your food processor with an S blade and begin to add a few pieces of banana at a time. The bananas will begin to cream and breakdown in sections, so keep adding a small amount at a time until the entire batch has gone. Whip the bananas until they are of ice cream texture, ensure not to over process them as your ice cream will become too soft, you just want the pieces to break down. Once whipped use an ice cream scoop to form some balls and serve in a bowl. Sprinkle some nuts, seeds whatever you want and drizzle some syrup on top. I love this vegan ‘ice cream’, I’ve tried it before but mixed in some frozen strawberries to make strawberry ‘ice cream’. It’s hard to believe how much the texture resembles soft-serve icecream! And of course, no more feeling guilty about going for seconds! Awesome, I bet mixing the bananas with strawberries gave it a nice swirl? I should try it and give you the credit once it makes it on the blog. looks so easy and yum! Bananas are just the best 😉 Found yr blog via Food Bloggers Central. It’s so simple and thank you for commenting. Loove this recipe. Its so quick and easy and that truely all you need on a hot day. Yes, definitely perfect for a hot summers day.